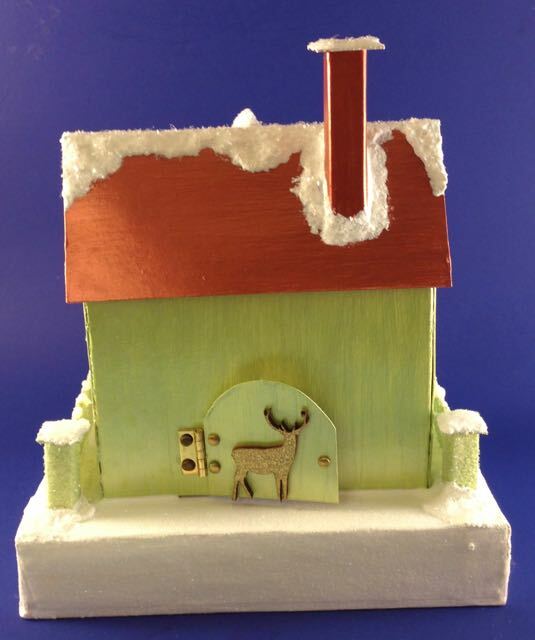 One unique way to light up Putz houses is to put a back door on the house that opens and closes to easily to fit an LED tea light inside. 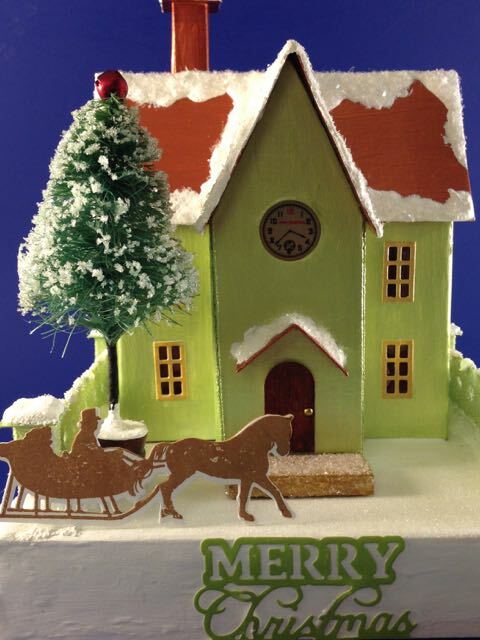 I’ve made a couple of houses with a door in the back for that purpose. 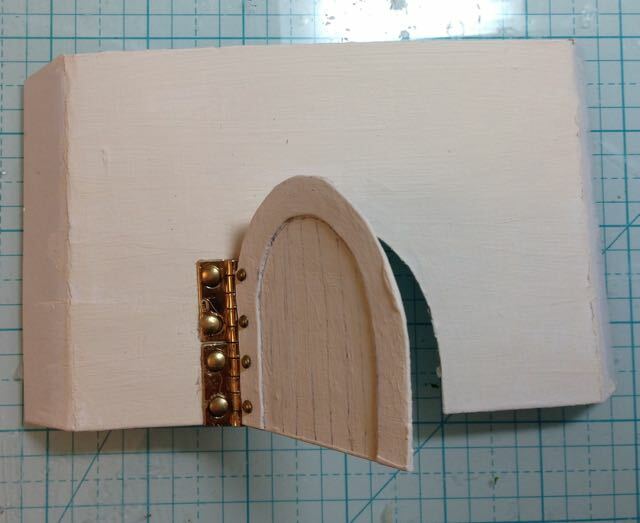 You only need a few materials to do make a door with a nice hinge that allows you do do this. 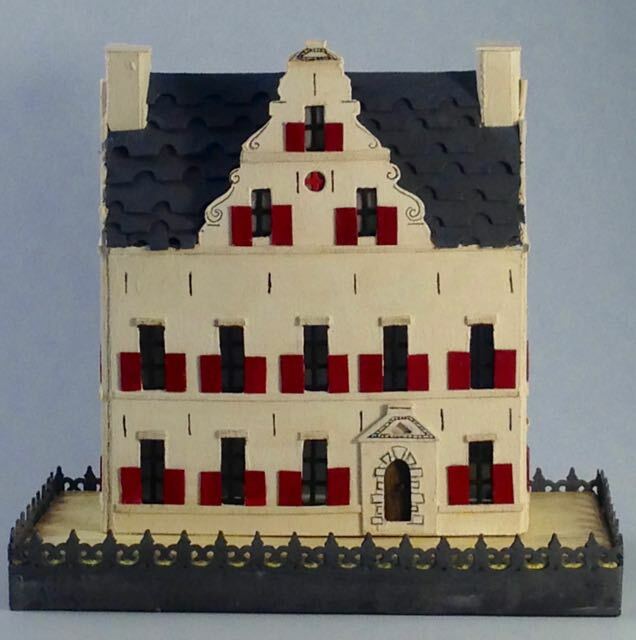 The other house I’ve made with a back door for lighting is the Middleburg Netherlands house also known as the St. Joris Doelen Guild House in Middleburg, Netherlands. 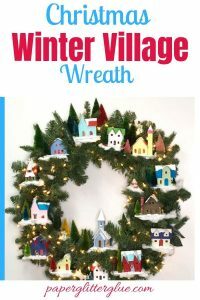 First, you have to make the Putz house big enough for the light to fit – most LED lights are 1.5 inches in diameter and about the same height. The door opening should probably be about 2 inches wide and 1.5 inches high. You can fudge a little bit on the height because you can angle the light a little bit to get it to fit inside. So the width of the house itself should be at least 3 inches in width. I’d recommend a height of at least 2.5 inches if you are going to make a back door on your putz house. Both examples above are 5 inches wide. 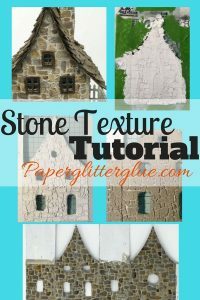 The next important consideration is that you need to make the back very sturdy because you are cutting a section out of the bottom of the house. Normally it is intact the whole way across and provides important support. 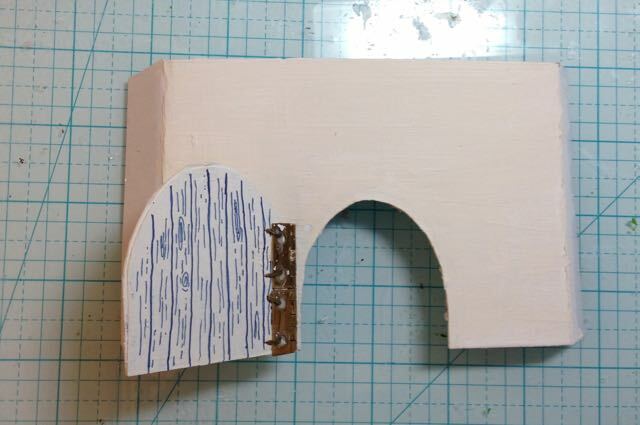 For that reason, I make the back with 2 sheets of cardboard otherwise it will bow out where the cut portion is. I made several prototypes before settling on the design I’m outlining below. Testing the fit of the hinges before gluing it in place. 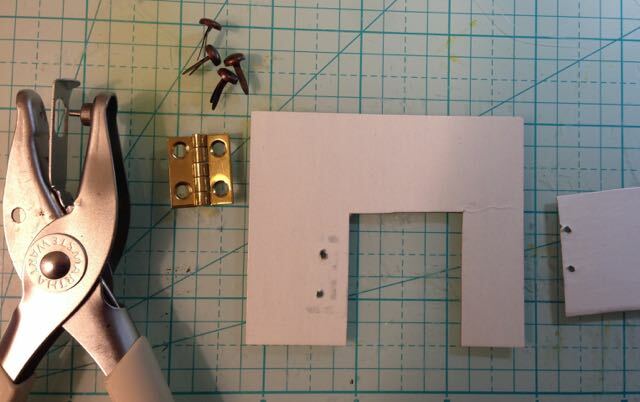 It’s best to attach the door to the hinge first so you can move the hinge if needed to prevent the gaps shown below. Remember this is just a prototype. The door should have been larger to cover the gaps in the doorway. Also the hinge should have been moved over just a little bit to help cover the gap. Here are some additional views of the door on the Middleburg Putz house so you can see how nicely it covers the doorway. 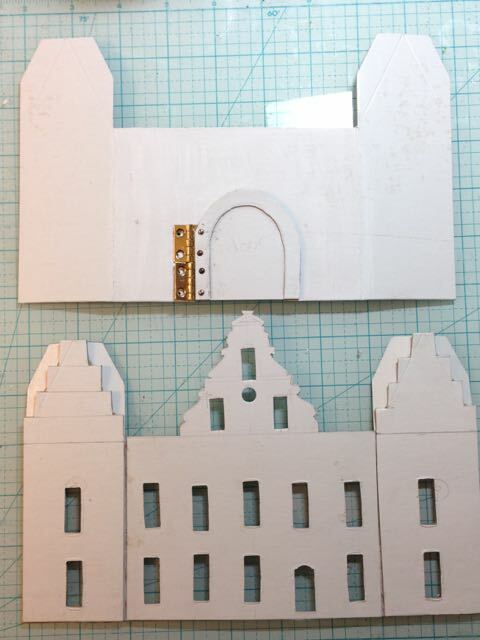 The photo below shows the best way to do a test fit – attach the brads to the door and then move the hinge so that you are sure to cover the doorway gap. Working on the back door on the Middleburg Putz house. 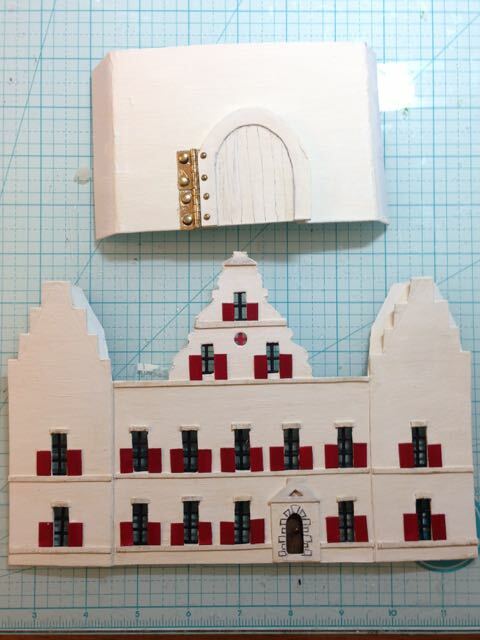 I made the door on the Middleburg Netherlands Putz House before I glued the back piece in place in case I did it wrong. Now make sure the door opens and closes like you want. Glue the brads in place with E6000 glue. The Putz door opens all the way. The brads were reinforced with glue to make sure they stay in place. 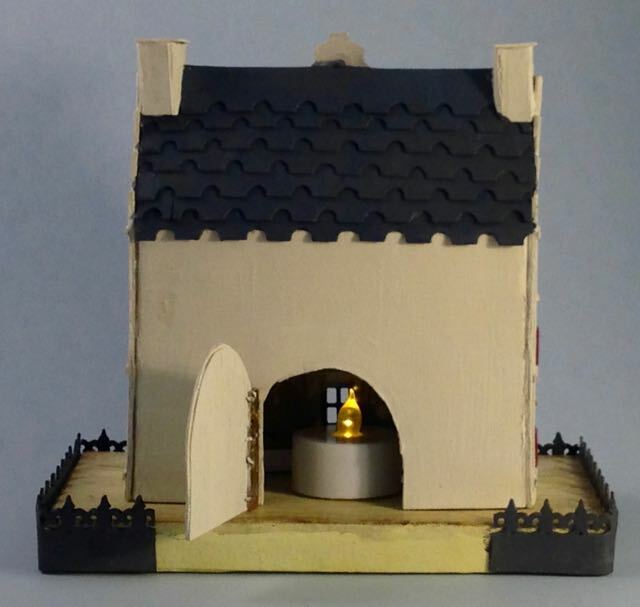 So the three ways to add light to your Putz houses are the traditional hole in the back, a hole in the base for lighting the house from underneath (which I covered here) and now with a back door that opens and closes. Choose the one that works best for your design. 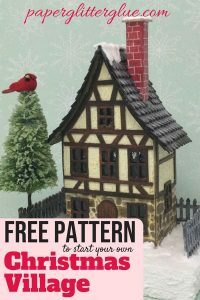 Have fun making the little houses. If you have any questions just let me know, I will be glad to answer. Oh, and if you have better ideas – I love to hear that as well. P.S. 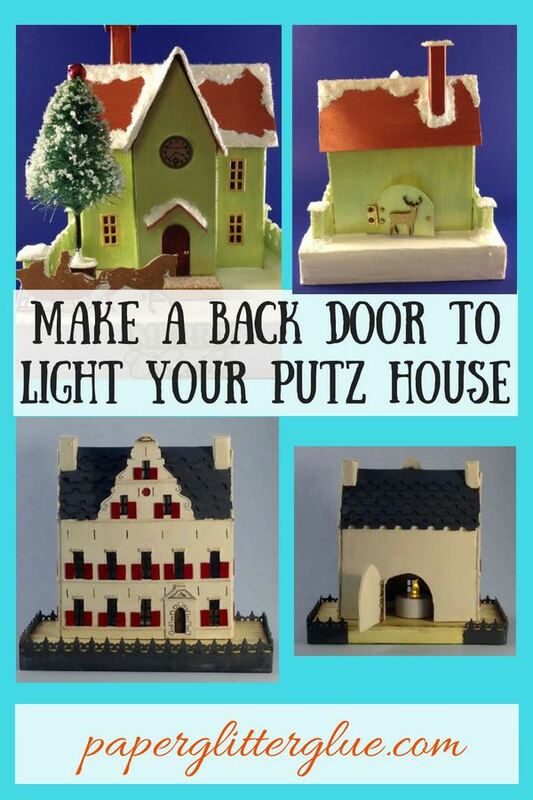 Add this to your Putz Board on Pinterest if you would like to remember where to find these directions. DIY a back door for your putz house lights. Thank you! Very helpful. 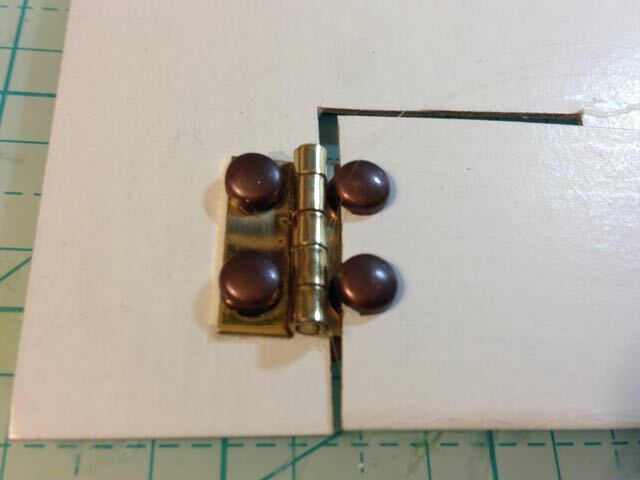 I had thought to just glue the hinge and put a bead to mock the screws. Hadn’t thought about doing this before attaching the back, helpful hint. 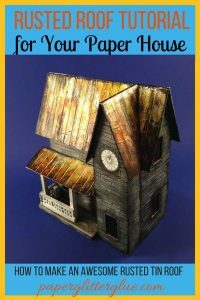 Excellent advice and some great little Putz houses!